The 'armour' base layer is the first thing you put on and the last thing you take off every time you work out. 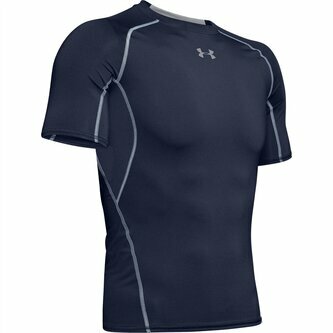 Make sure you're comfortable in this Under Armour HeatGear Compression S/S T-Shirt in Midnight Navy and Steel. This ultra-tight base layer t-shirt will feel like a second skin to prevent any distractions whilst you put your body to the test in the ultimate workout. The HeatGear fabric moisture transport system wicks sweat away from the body whilst the 4-way stretch fabrication allows for greater mobility in all directions. The stretch mesh underarm panels deliver strategic ventilation whilst the UA compression is comfortable enough to be worn all day.